Merchant Tower™ is Campbellsville’s most important building. It’s Romanesque architecture anchors downtown and overlooks Campbellsville University. This building is currently being renovated. This structure is a historic building unto itself and also sits within a historic district. The building is both significant and unique for three architectural reasons 1.) the triple arch entryway 2.) the second story balcony 3.) the tower. The building is listed in the National Register of Historic Places (since 1980). The importance of this building to Campbellsville can not be understated. In May 2002, a report was commissioned by the City of Campbellsville Renaissance Committee to study downtown commerce. The report’s conclusion listed renovation of the Old Merchant’s Hotel as the overwhelming issue necessary to improve downtown commerce. 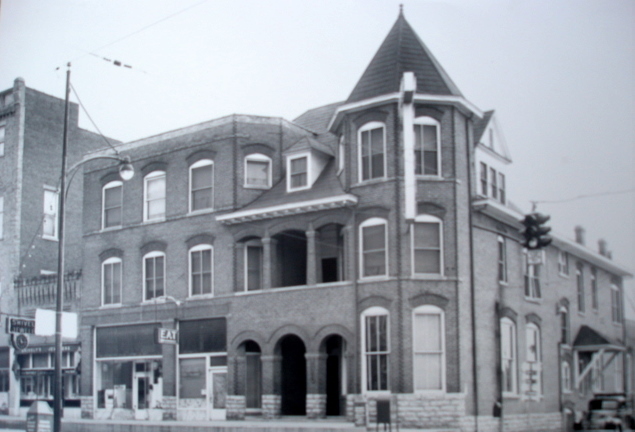 And, in many other numerous historical documents, the building is described as the “gateway” to the Campbellsville due to it’s location and commercial heritage. Now that renovation is underway, an overwhelming response from the community helps move this project forward. The building is approximately 15,000 sq ft. with 3 stories and a partial basement. Its construction is triple-brick masonry walls, oak wood structure, and pier and beam floors. One notable exception is the old lobby which is concrete and covered with a black and white mosaic tile. Upon review of the 1915 city map, the 1st floor was restaurant, not hotel rooms. For many reasons (floor plan, location, feasibility, etc. ), this magnificent building is better suited as a multi-use retail/restaurant/office space. Repurposing the building so it has a useful future is the single most important factor to rescuing the building. Therefore, Merchant Tower replaces the former name Merchants Hotel. The same first name preserves the building’s identity while a different last name signifies the building’s architecture and grand stature. The name change was also necessary to brand the building as something other than a hotel so the building can reach it’s full marketing potential. Merchant Tower™ is not only a new identity, but its also a new trademark. The trademark will keep the building’s identity unique and let other’s know its one-of-a-kind found only in Campbellsville, KY. The building was sold on July 1, 2008 to a private firm that will rescue, renovate, and revitalize the building. The goal of the rescue phase is to save the brick facade on Main Street and South Columbia and make portions of the building water tight. Sadly, the building didn’t have to end up this way. There are 6 places on the roof where minor repairs were neglected. Poor chimney flashing, unfastened steel roof panels, and heat-worn shingles were the demise of this historic structure. A handyman with a hammer, nail, and tube of caulk could have saved this building from the elements. Through the years, the building had been stripped of all valuables (fixtures, furniture, wiring, and even the front sign). So, there is little need to save or salvage the interior, it’s already gone. Initial Assessment: 70% of the wood structure is damaged and will be removed throughout 2008 and early 2009. Fortunately, the remaining 30% is the part worth renovating. Several cement block structures (approx. 3,000 sq ft) in the back of the property will be removed (pending contractors and permits) because they detract from the original brick structure. New roofing is coming in mid-2009 pending demolition and inspections. Renovation is scheduled to begin March of 2009. Architectural and construction plans are in the works now. The exterior will get new windows and new entry doors to replace the foregone wood. The interior will be renovated with exposed beams, exposed brick, and natural concrete floors. The old hotel lobby floor with mosaic tile will remain as-is. The rebuilt sections of the building will get a new floor plan with modern facilities and amenities. The Main Street front will be refinished for “drive-by window shopping” while the back with have 3 new grand entrances with courtyard. The main access to the building will be from the back where there is ample parking. Revitalization begins in the fall of 2009 and continues indefinitely. This long term strategy correctly markets the Merchant Tower building as an icon for Campbellsville. Merchant Tower has always been and will continue to be the gateway to downtown. Retail and restaurant space will thrive on the first floor while the town’s premier professionals and financial services companies (architect, legal services, insurance, accounting/CPA, real estate, etc) will thrive on the 2nd floor. The 3rd floor may someday become Campbellsville’s premier office/condo or penthouse loft with a 180° view. This multi-use of space is a popular strategy in many downtown areas throughout America. Revitalization is not just an actionable cause, but it’s also an effect. Twenty years ago, many downtowns dried up because of the “Wal-Mart effect”. But now, the “reverse Wal-Mart effect” and rising gas prices are bringing people back to town centers. Wikipedia: See more on Wikipedia about Merchant Tower, Campbellsville, Campbellsville Historic Commercial District, Main Street and Main Street Programs.